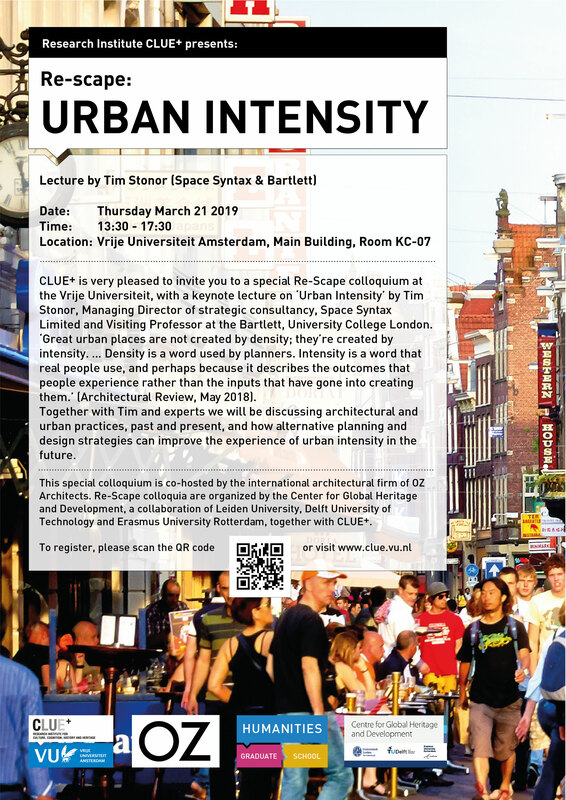 CLUE+ and Centre for Global Heritage and Development is very pleased to invite you to a special Re-Scape Colloguium at the Vrije Universiteit, with a keynote lecture on 'Urban Intensity' by Tim Stonor, Managing Director of strategic consultancy, Space Syntax Limited and Visiting Professor at the Barlett, University College London. "Great urban places are not created by density; they're created by intensity... Density is a word used by planners. Intensity is a word that real people use, and perhaps because it describes the outcomes that people experience rather than the inputs that have gone into creating thema." (Architectural Reviews, May 2018). Together with Tim and experts we will be discussing architectural and urban practices, past and present, and how alternative planning and design strategies can improve the experience of urban intensity in the future. Register by visiting www.clue.vu.nl or scan the QR code at the flyer.